If your domain name expired more than 18 days ago, you can attempt to recover it. Besides the cost of renewal, you might be required to pay a redemption fee. If your domain expired less than 18 days ago, you can manually renew it. Note: These steps will need to be completed while logged in on a computer. This option is not available on mobile. 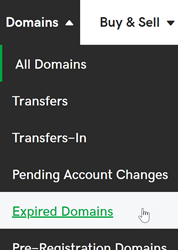 From the top menu, click the Domains tab and select Expired Domains. Note: Domain not showing on this page? You can renew your domain from the renewals section of your account. Select the registration length for the domain names and click Next. Note: Registration lengths for multiple domain names can vary depending on maximum renewal lengths allowed by each domain name registry. Click Finish and complete the checkout process. Sync your domain renewal dates with ConsoliDate. Some domain names, such as ccTLDs, may have special requirements for recovering after expiration.